Tender and flavorful Grilled Ribeye Steaks in homemade marinade with red wine, Worcestershire sauce, olive oil, pepper, and mustard. Combine all ingredients except steaks in a medium sized bowl. Place steaks in a Ziploc bag. Pour marinade into the bag. Seal and allow steaks to marinade in the refrigerator for at least 4 hours. Preheat the grill to high. Brush some oil on the grates. Drain and discard marinade. Place steaks on the grates and close the lid. Grill steaks for 7 to 9 minutes on each side for medium doneness. Watch closely to avoid flare-ups by opening the lid occasionally. 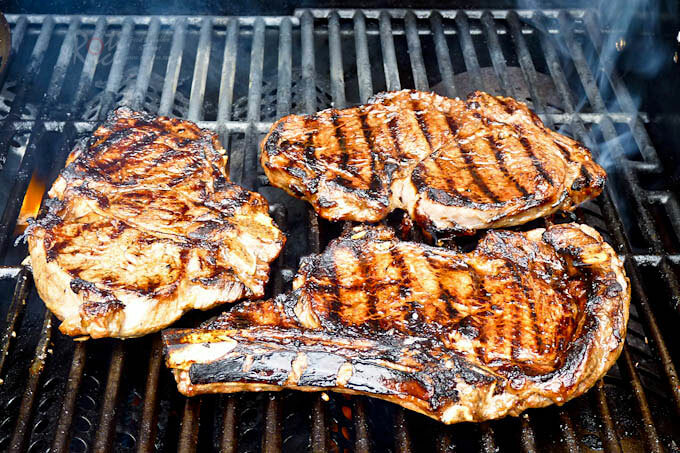 Move steaks to a different part of the grill to avoid charring if flare-ups occur. Flip only once. Transfer steaks to a platter. Cover loosely with aluminum foil and allow them to rest for 10 minutes. Season with a little salt and freshly ground pepper before serving.